Uhh so please excuse that thing on the top of my head. I could have sworn I was wearing a neat and tidy bun on my head but boy was I wrong. Anyways it has just been so hot lately that I have really been wanting to wear as little as possible/chop all of my hair off. AKA mini skirts/dresses and short shorts are basically what I have been turning to. These photos were taken by Dylana before heading to her place. This beautiful street is right next to both of our places. We are so lucky right? She made me an omelete complete with spinach and pesto. Yum! We even watched when Harry Met Sally while eating as well. Anyways, I am so excited it is Friday! It's going to be a great weekend to be in Philly! hope you all have a lovely weekend. love this outfit so much- you look adorable :) love the t-shirt especially!! P.S. - Omelets are yummy and When Harry Met Sally while eating?! Even better! You look so beautiful...lovely pics! awesome outfit - I adore your girly skirt and beautiful shoes. You are so stylish, how you do it? This is the perfect casual outfit! i am just in love with that skirt! :) So cute and girly! I love the oversized pocket! Very cool oxfords as well. And I think your bun looks great! Oh, you look so sweet and cute! I love that shirt! It looks comfy and casual but still great paired with that skirt and all. And I love the bun on the top of your head too. :D Happy Friday! Aww, I love your hair up! It's a carefree and beautiful look. The skirt is a dream, and the view between you and Dylana's place is very picturesque. Have a lovely weekend, girl! Stripes, pleats, and oxfords!? I adore everything about your outfit. I adore the pleated skirt with lace trim! You look great as usual, Bonny! PS. Thanks for the sweet comments on my blog! Wow, I love your skirt - I'm having such a love affair with pleats these days! 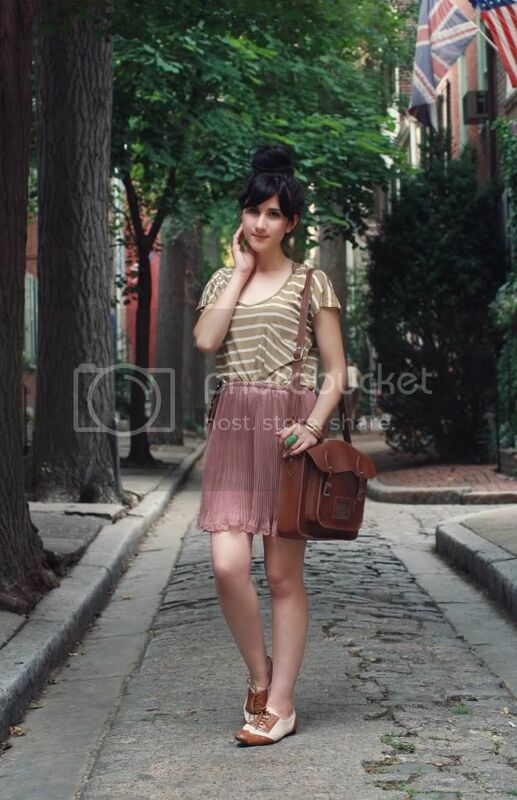 That has GOT to be the prettiest pleated mini I've ever seen <3 Love how you wore your sunnies on your skirt too! you look beautiful even despite the messy hair! (which i actually like a lot haha) your hang out with Dylana sounds perfect and how lucky are you to live on this beautiful street! Sometimes in the summer heat, a bun is the only way to go. I love your skirt! And it looks great with your striped top! love this look. so cute! Hi pretty! !your look is lovely..i love the skirt and bag so much!!! beautiful skirt! and i think your hair looks good like that, love messy buns. I always love how you mix and match things. The lace trim is adorable on the skirt. And I love the pink and brown together. I'm ur big fan! I love this outfit,ecpecially ur accessories! I really,really like this outfit. It's so lovely. I love your skirt. the colours your wear are always so nice. I actually love the bun... it's fun and carefree. :) Looking great as always, my dear. The same thing always happens to me when I wear buns on top of my head! How irritating it is, and I always think "goodness, did I really go out into public looking like that!?" The hair is one of my favorite parts of this outfit!! It totally fit. I love the little skirt. Those lace-trimmed shorts are darling! I like how you paired them with that striped top.Perfect outfit for summer! Gorgeous outfit, I love the skirt! It's been super hot here also, and it just makes me wish I was born someplace cold, or at least chilly all year around. It is indeed a lovely street, and you make me want an omelete like crazy. GIRL I THOUGHT THAT WAS YOU! You totally let me into a fitting room today at Urban. 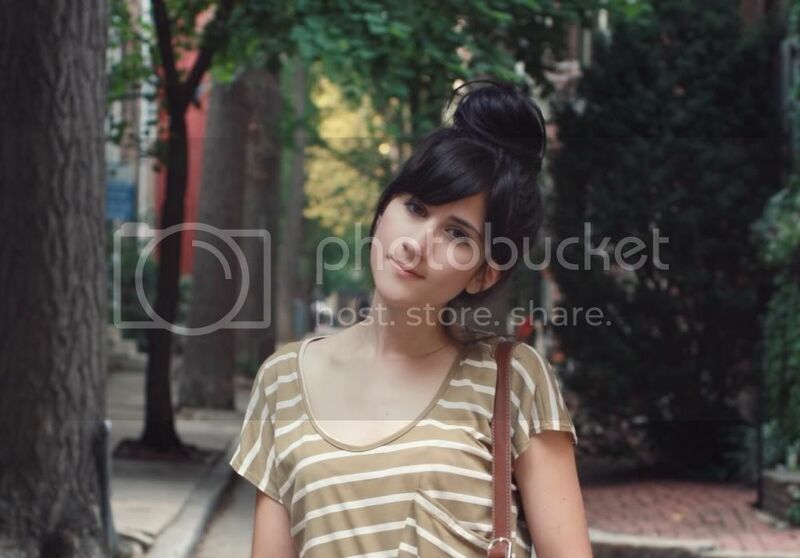 I used to be on chictopia & have a blog (style-magnet)... um, and I think we should be friends. In the least creepy way possible...! You look so pretty! very cute skirt :) I really love your blog! i LOVE that skirt!!! it's so perfect and pink!!! Omg, the heat makes me want to go bald! Haha, and you honestly can make the most casual outfit look so chic! i love your hair like that!! its messy cute. and the skirt is so pretty! your outfit is lovely, especially that skirt. I'd love to visit Philly one day because of what I've seen in your backgrounds, so pretty. I adore your outfit, so casual and the colors look great together! I love the hairstyle and the outfit. See you and have a great weekend! What kind of camera do you own? your pictures are always lovely. I love your hair in a bun, its so chic! To top it all off, you have put together the most adorable outfit. this is just so effortlessly chic!!! love it!!! Hah, I actually really really like the messy bun! You look adorable, babe. You look so sweet and romantic in this attire. I think the skirt may have something to do with it too! I love the pleats and the sheerness of it all! You look adorable! Lovely skirt and lovely oxfords. Thanks for being such an inspiration for me! I love everything about this outfit! the top, the jewellery.. and the bag and shoes go together beautifully! Ah so bummed I didn't hear anything about this blogger meet up. Would have loved to meet you! I love all of this! 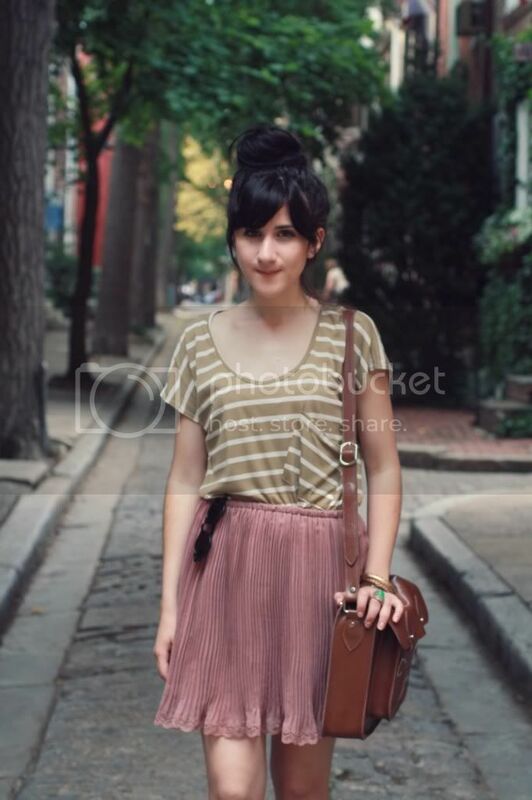 the striped shirt, the pleated skirt, the satchel (even the bun) so cute! you look gorgeous! i love your messy bun and your flirty skirt! I bet they're in love with your outfit like me! I really love your skirt. The color is great and gives off a nice vintage vibe! are you kidding me your hair is so nice i love it!! !